Here are ten facts about the larger than life President of the United States of America, William Taft. William Howard Taft was a Republican and held the office of President of the USA from 1909 to 1913, serving one term. He was the 27th President and the successor to Theodore Roosevelt. Taft was a large man, both in height and in weight. He was 6 foot tall and, when he entered office, weighed 330 pounds, or 150 kilograms. He was get teased about his weight throughout his life and once got stuck in the White House bathtub! 6 aides were required to get him out. 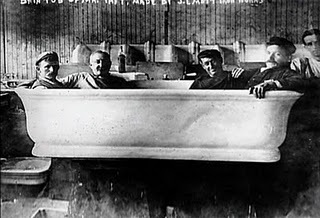 After the incident, a larger bath was installed, big enough to hold 4 people. Taft served only one term as US President. In fact, in the Presidential election of 1912, he suffered the worst defeat of any serving President aiming to retain the Presidency for a second term winning only eight votes from two states, 4 from Vermont and 4 from Utah. Prior to becoming President, Taft at one time was Solicitor-General of the USA. At the time of his appointment in 1890, he was 32 years old and remains the youngest person to hold this post. Taft used a walking stick that was a quarter of a million years old! It was a cane given to him by a W.S. Foster, a Geology Professor of Spokane, Canada. It was purpose-made from an ancient stub of wood and was used by Taft from 1920. Taft's last position was as Chief Justice of the United States. He retired five weeks before his death. He died on 3rd February 1930, on the same day as Associate Justice Edward Terry Sanford who died suddenly after having a tooth taken out. It is now traditional for the US President to throw the first ball of the baseball season. This tradition began when Taft through the first ball in a game between the Washington Senators and the Philadelphia Athletics in 1910. President Taft had his own cow to provide him with fresh milk. The cow's name was Pauline Wayne. She was the last cow to graze on the lawns of the White House. Taft was buried at Arlington National Cemetery. He was the first former President to be buried there. The second, on so far the only, other former President to be buried at Arlington was John F Kennedy. Taft was the first American President to own cars while in office. One of these was an electric car, a Baker Electric (and you thought electric cars were a new invention!). He was also nearly the first President to get caught speeding. He was a passenger in one of his cars while been driven on a road in Newbury, Massachusetts. The speed limit on this road was 8 miles per hour although it had previously 20 miles per hour. President Taft avoided a ticket once the policeman realised who he was.